Note: This review covers each individual episode as it releases. Currently Episodes 1-4 are represented here. All reviews are spoiler free across the board, no new episode spoils previous ones. If I may be so bold, narrative fiction games have all lacked pretty heavily in the goals they are trying to achieve. By narrative fiction I mean the pantheon of TellTale Titles (Walking Dead, Batman, etc. ), Life is Strange, and even games that weave it into larger experiences such as Mass Effect. These games all claim to remember your choices, note them, and use these items to essentially alter the story of the game as you play. It is in this regard where I feel they all fail. The path never changes, the outcome is always the same, and for the most part the only thing that shifts are the characters involved, which are often just proxies for the ones intended in the cannon. The only game that shook this was the now cult title Alpha Protocol, which was notorious for several delays, a system behind the scenes that was far too complicated, and a lukewarm reception from audiences and critics alike. 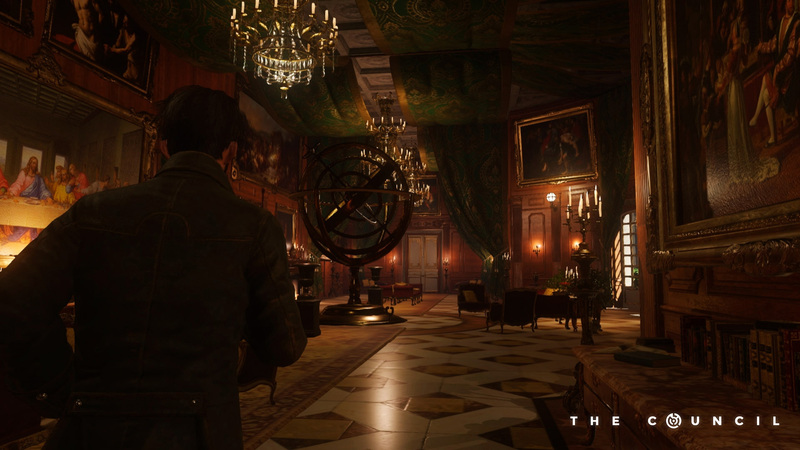 The Council, a new episodic title from freshman developer Big Bad Wolf hopes to buck that trend with a game that focuses heavily on investigation, personality, and decision-focused storylines. If this first episode is an indication of the overall experience, the next evolution of narrative fiction may very well be upon us. The story is also compelling for those, like me, who are also history buffs. 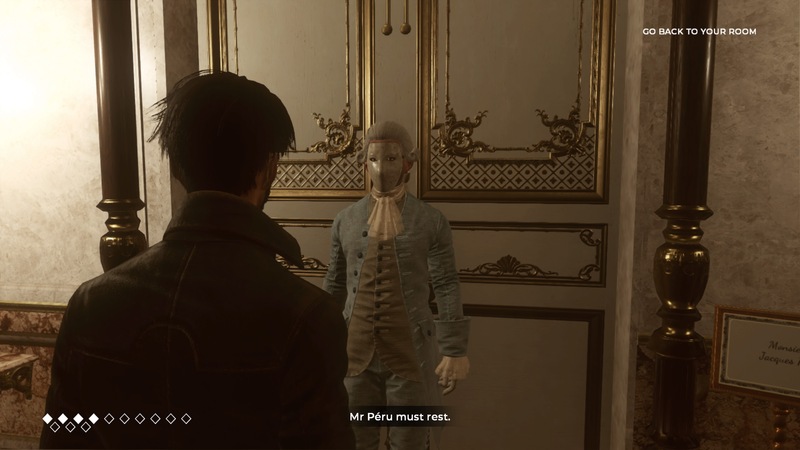 It takes place in 1793 and you play a Frenchman named Louis de Richet who is part of a secret society, the leader in France being his very own mother. When she goes missing at a private island off the coast of England owned by the mysterious Lord Mortimer, Louis is called to come to the exclusive landmass. When I say “exclusive” I do mean that in every way. You can only go there if invited and to call it posh is to devalue the extravagance of everything you see around you; it seems Lord Mortimer is wealthy beyond standards of any one country. Whenever you deal with a person of such wealth, it stands to reason that notable individuals will also be drawn to them as well, which then leads to the number of true historical characters in The Council. So far I’ve met George Washington and Napoleon Bonaparte but there were hints at quite a few others, not to mention people you could include in spoilers. The Council makes no qualms about the fact that all of the plots involving historical characters are fictional, but also throw out that the storylines are based on actual facts. Others are also woven into the plot that I’m pretty sure are not actual figures of history such as Cardinal Giuseppe Piaggi, who works closely with the pope, and an English Duchess who has grown favor with the Crown. It makes for a great cast of characters and dialogue connecting real history with fictional, making everything that much easier to believe. At its core the game plays much like a hybrid role-playing game (the traditional definition) and an adventure title. You’ll partake in several different activities such as investigation, interacting with just about everything to take in the sites and scenery, and of course conversations. 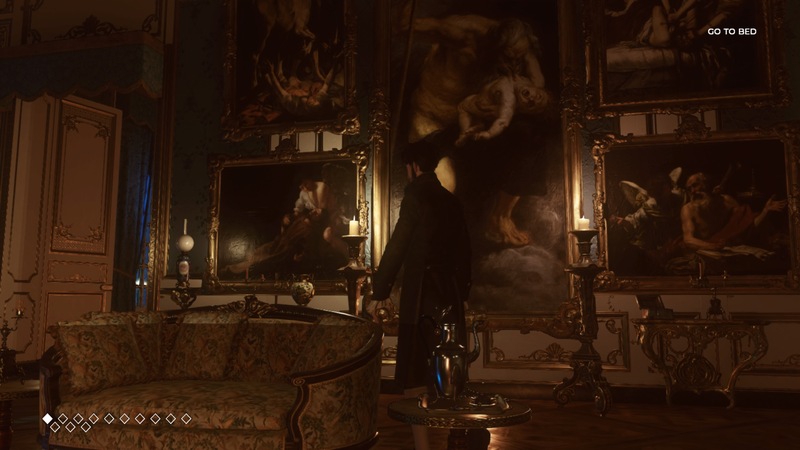 The art design definitely made the vast estate of Lord Mortimer into a spectacle to match his wealth, so I had no problems indulging in just about every bit of lore I could find. You’ll frequently be forced into scripted events that are primarily dialogue. The episode is broken into multiple chapters, each allowing you to put points into various skills that primarily assist with this dialogue, but also have uses in your exploration. Since the character tree is designed to last you, presumably the entire 5 episode excursion, you are very limited in the amount of points you get. This makes the decisions in what to level far more critical in these opening moments as you will frequently see opportunities pass you by unless you spec for them. There’s no catch-all spec, so don’t go trying to min-max because it’s simply impossible. That very much seems by design, which I find refreshing. To assist you in making some of the skills cheaper you get to pick from one of three main personality types. Each personality type has five of the overall skills and the points required to level those are significantly reduced, but that doesn’t prevent you from being able to focus on a non-personality skill if you’re willing to use a larger number of your scant points for it. This will either be daunting or enticing to certain players, but I was pleased with such freedom and spec options. You will also gain some points organically based on your decisions, but I never counted on them in either of my playthroughs of the first episode. There are also big decisions to be made when deciding where to go or what to do next, which will eliminate the opportunity to see/experience the other. Think of these decisions as the one’s in The Witcher, neither is necessarily good or bad, but you have to make a choice. It all comes together when you start applying these concepts to your dialogue, which is a significant part of the overall gameplay. When dialogue happens, it’s either in a peaceful setting where you listen to conversations and attempt to make the most of the situation or confrontations. If you’ve ever played a BioWare or Bethesda RPG, you’ll be familiar with the concept of the peaceful conversations. As with those games, depending on the build you have for your character, you may be given prompts to intercede with additional information or additional response options. The game also lets you know when you’ve missed a chance at engaging in a side conversation or extra response so that you can note to build those skills in another play, should you wish to see where it goes. There are also a few wrenches in any situation: each person you speak with has weaknesses and immunities while Louis has a limited number of points to flaunt his abilities. Those weaknesses and immunities are not known at the onset, so you have to discover them as you go and in many cases that will be when you choose a dialogue option. Each person may have multiple immunities and/or weaknesses, but I’m fairly certain they all have at least one of each. I don’t want to reveal any actual answers, but a good example would be to imagine that the philosopher Plato was one of the guests. He would probably be immune to Philosophy and thus any of your misdirection involving philosophy would be countered and identified, but perhaps if there was a sympathy skill he would have a weakness to it that you could exploit that instead. At the same time you’ll also need to spend points to perform certain targeted actions, which will vary depending on how much you’ve leveled up that skill. As a result, you may not have enough points to misdirect them in conversation and you’ll be forced into canned choices. It’s pretty straightforward in the game, but I can understand if it feels a bit convoluted here. Then there are the moments of direct confrontations, each with consequences, and those require you to either pass or fail a heated interaction. To fail is to potentially close a door and to succeed has the potential to create allies or even see new sequences or areas. I found all of the dialogue sequences to be rather enjoyable as they are a gamified battle of wits. As much as there are plenty of positive attributes to The Council’s initial episode, there are some glaring faults that may be deal breakers. For starters the graphics, while impressive, lack in the animation department. Whether it’s the game engine or the animators themselves, things just don’t always move in a believable way and the voices don’t always sync up with the dialogue. I know that’s been a common problem in games this generation, but for one so focused on plot and dialogue it’s distracting here. There are also vast differences in quality with the voice acting of characters, most notably your protagonist Louis. While the cast overall does a decent job, and I was particularly fond of the Duchess and the Cardinal, Louis has probably the most inconsistent voice acting. He’s alright, but sometimes the performance is unconvincing, especially for someone of his role in life. I also don’t like the way he represents my dialogue choices at times, either. As already hinted earlier, the systems in this game are pretty complex and it’s quite daunting in the beginning to figure out exactly what you’re supposed to do and how to spec your character. There’s also the fact that points are over-used as a currency – you use them to build skills, use skills, and also quantify how well you did in the chapter but all from different pools so when the game simply uses the term “points” you may not know exactly what’s being referred to. Finally the UI leaves a bit to be desired as a necessary evil of trying to make the largest audience happy. Role playing fans will love the endless point sheets, notes in the journal, as well as the mystery of what the consequences of your choices will be without any real guidance. On the other hand, a traditional gamer will probably more appreciate the notes on when you don’t have an appropriate skill, the big green and red text to indicate a success or failure of a confrontation, and incessant battling of limited use items for challenges. As you may expect, both groups can be annoyed by the others’ selling points, so in the end no one is really happy. As someone who would like to think he’s in the middle, I found gripes with both features, but nothing was a deal breaker. 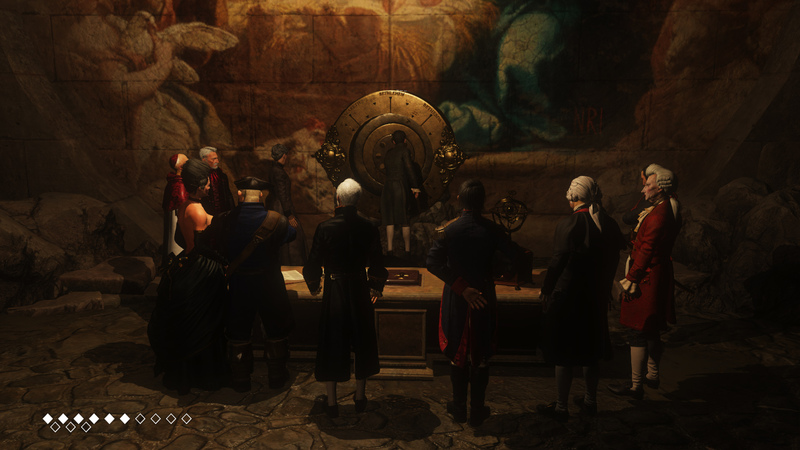 I enjoyed my time with The Council’s first episode, enough to play a second time and see how things changed. It’s impossible to tell if this title will be able to stick the landing, but I’m going into the next episode with a large degree of optimism. I like the unknown and the way this title makes you actually role play instead of try to game the system. It’s totally breakable I’m sure, and anyone with enough free time and a pad of paper will probably be able to point out the part where the seams are showing. That said, it was far more obvious in most other interactive fiction I’ve played in the past. There will be players that are annoyed by the fact that you have to make so many decisions with no idea what the consequences will be, especially because there’s really no way to course correct once the game is in motion. I would tell them to simply replay the chapter and hope for a different outcome, but the reality is that few gamers finish titles and even fewer replay them, so that’s unrealistic. To me, The Council offers a unique opportunity to play through an elaborate version of the dinner party murder mystery and captures the feel of true role playing better than its peers. I played the episode twice and had completely unique experiences by making different choices. If you want to become a different character and run through scenarios and experiences, it’s a worthwhile endeavor, flaws and all. If this is just another game in a growing backlog that you just want to fly through and move on from, you might be better suited to avoid this. The Council looks to be something special, but as with all titles in this genre, we’ll have to wait for the remaining episodes to confirm. I really wish this game had a demo, if only the first chapter or two in this episode, because asking people to buy the bundle only seems a bit of a stretch. In many ways I consider the third episode of a five episode series to be the moment of truth. It seems episodic titles are doomed to have weaker second episodes because of the natural arc of plot and character development, but typically you get a twist and/or climax in the third episode that redeems everything. While The Council definitely follows this formula, it was disappointing to see that while the story takes some drastic new turns, what you actually play is the same old song and dance. I don’t know what I was expecting, but it surely wasn’t yet another trip through the mansion followed by a huge dump of exposition and concluding in a long obtuse puzzle…again. Regardless of those expectations, that’s exactly what I received, which has me weary of future episodes and frankly a bored in the current one. I didn’t even play this episode a second time, there seemed to be no need. If you’re not fully invested in the overall season before going into this episode, it’s probably best you stay away for now. We left Louis in quite the cliffhanger at the end of episode 2, and even though Ripples starts off right at that moment it’s all frantically worked around and you’re back in another council meeting with little activity to report. There is a bit of investigating you can do in the area before moving on, but how wasteful that it doesn’t turn up any information that holds much value even if you have the right skills at your disposal. While I found the skill system interesting at the beginning of the overall game, by the time you reach this episode it’s all a tired balance of what you’ve unlocked and how many of the abundant usable resources you’ve collected. Perhaps I’m more thorough than most but I’m constantly loaded with the maximum number of all four special items during a majority of every episode so far. Either way, this opening sequence foreshadows the fact that outside of the main story you won’t find much value in any of the skill-based investigations or additional info. This trend continues in the two confrontations that occur in the first third of the episode only to disappear without a trace for the rest of it. At this point the two individuals I was at odds with did have higher stakes – in one case if I failed to select an appropriate answer it would mean a potentially fatal failure for the other person – but by this point I knew enough about both people’s immunities and weaknesses that the answers were clear as day. This mechanic worked with a lot more risk in the first episode, perhaps even to a certain extent in the second, but confrontations need to evolve at this point lest they become pointless given the information you now have at your disposal. Interestingly, this episode also began to greatly quiz the player on their memory regarding minute details of certain characters, which seemed unrealistic. I don’t recall the specifics of a conversation in episode 1, especially given that it came out months ago and it’s not fair to assume I or anyone else would replay it just because another episode has come out. Developer Big Bad Wolf could benefit from either finding a clever way to weave in a recap or making these momentary questions a bit less random and specific. It’s even topped off by a required decision at the end of questioning with very real consequences that you won’t discover until future episodes. Ultimately we have a disconnect of too much information for confrontations and too little information for spot check questions from random events. In direct contrast to these flaws that have continued as episodes progress, the story has picked up and we’ve finally gotten some solid answers to early mysteries. While you would not be out of place to call the two twists in this episode cliche, I must admit I liked the change in direction. 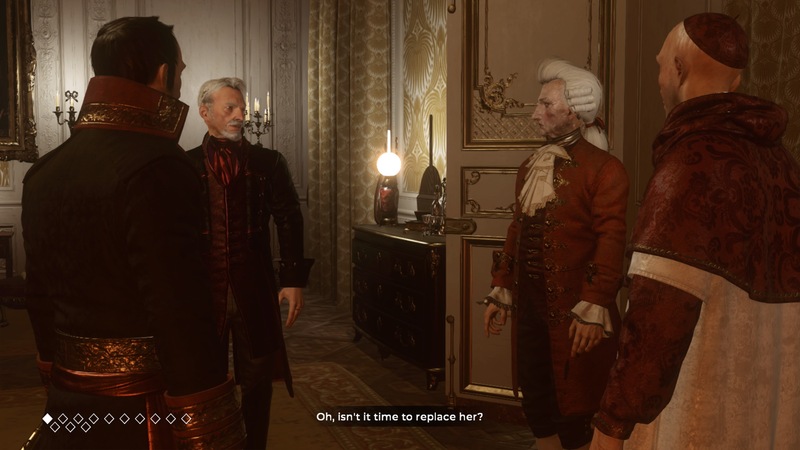 I’m more passive about storylines, no matter how outlandish, provided that the developer leans into its decisions and takes a confident but realistic approach. In that regard Ripples does succeed. Sadly just as soon as it does so, we are greeted with the mother of all fetch quests (six items scattered about the property, really?) followed by a puzzle that I did manage to solve but took far too long and had me constantly wondering if it was worth it. 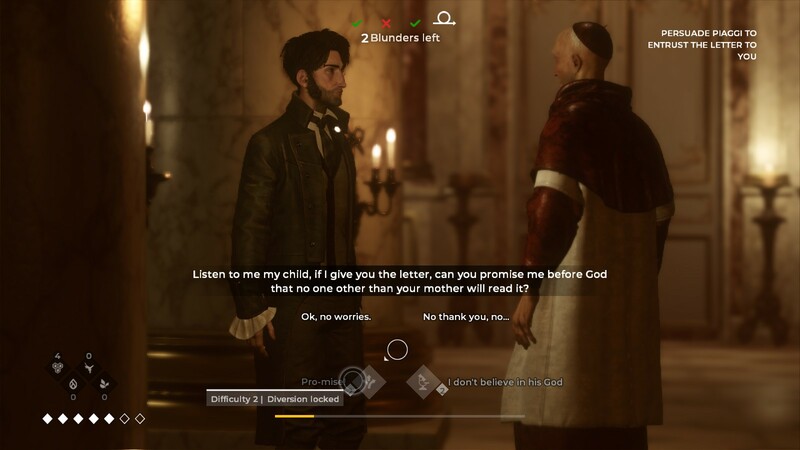 At this point there’s no doubt a walkthrough online, but keep in mind I played this the first night it was available and that option was not only scarce, but probably wouldn’t be appropriate for a reviewer. 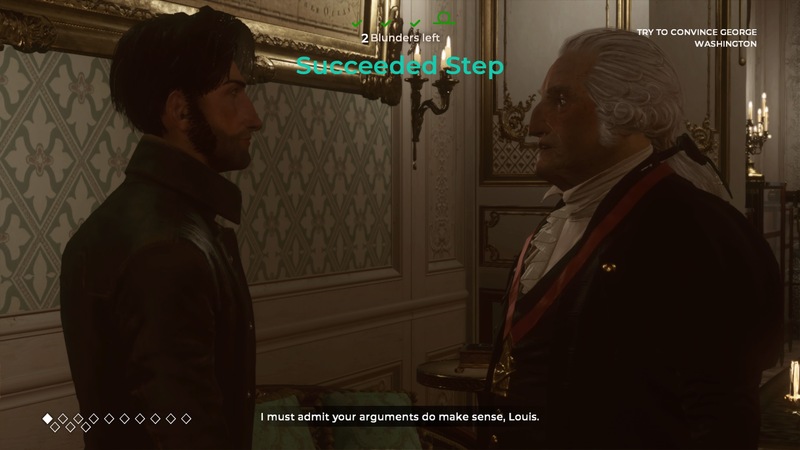 As is the case with many points in this episode, the stakes are pretty high as well with a permanent consequence to Louis should he commit to a solution that is incorrect. If I spent the 30-40 minutes digging through various texts trying to find the correct answer and getting punished as this episode can for an error, I could see myself getting livid. Then again, I don’t know that there’s been a good reason to care all that much about what happens to Louis outside of him being the player character, so perhaps I wouldn’t care all that much as long as the story continued (and it does). Either way, Ripples couldn’t seem to land on a positive note for too long before rearing another ugly head of either weakness or redundancy that has me concerned for the final two episodes. 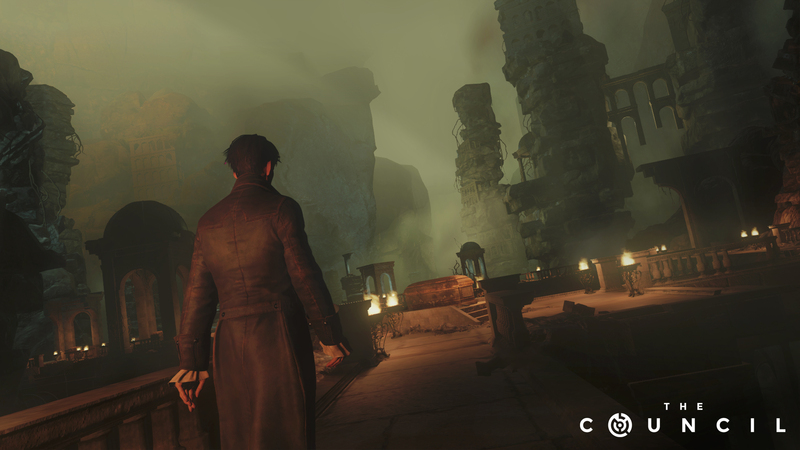 If you like The Council‘s way of making a modern day adventure game where you explore the same areas over and over with a new objective, knowledge puzzles that are both out of place and often too easy, and the fetch quest that continues to grow in scope, then this will not disappoint. I know it sounds like I’m being negative as I say that, but it’s more that I don’t care for this type of gameplay even though I can see why one would. I may also be against the grain with how I appreciated the new direction of the story as some big questions got answered, but the plot is hardly good enough to excuse the gameplay if it isn’t your thing. I was hoping to see an uptick in episode three as I’ve seen in several other titles, but the fact is Ripples didn’t have it and The Council is quickly becoming a one-trick pony. While I remain cautiously optimistic of the direction, it still continues to be a missed opportunity to the point that the skill system seems almost unnecessary and the consequences to your actions are vague at best. Here’s hoping it can all be turned around in the next episode, but I feel this episode was rushed out with no new ideas and completely eliminates the purpose of an episodic title. Episode 3 came to a close at what appeared to be a potential conclusion to the entire plot. While the goals of the council itself had not come to pass, Louis and anyone accompanying him had little interest in those matters anyway. When you enter into episode 4 a vast new location is revealed and I was wondering how they were going to avoid having him pick up the item he needed and calling it a day. Of course, multiple fake versions of the item necessitated a fetch quest that has you leaving your new venue just after arriving to yet again navigate the grounds talking to people and hunting down helpful documents. To my surprise, after running these errands and selecting the right item, the story very much does start to wrap up. It gets so close, in fact, that I wonder if this was originally how the story was supposed to end in episode 5 because the second half of the episode comes due to an out of nowhere twist. The Council literally throws out the context for all of the previous plot (and even relieves itself of some characters in the process) becoming a new game, complete with a new mechanic and overarching goal. I have to admit that a risk like this takes balls, but if I had invested any strong opinions on the world I was introduced to at the beginning of the game, there’s little reason to keep playing after this twist. The developers just threw the baby out with the bath water. 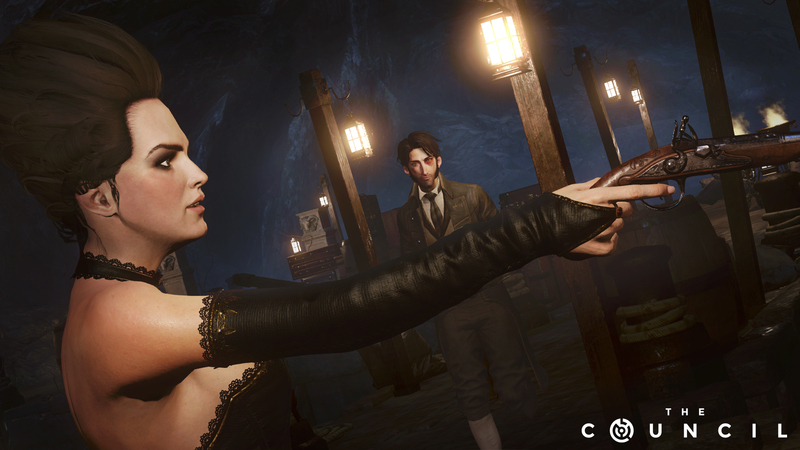 On the other hand what we do receive is a crazy take on alt reality as opposed to simple alt history and the game seemingly begins anew with Louis – and you the player – having to shift everything he knew into this new perspective. At this point I do want to see where the story goes, but all of this focus on plot can’t distract you from the gameplay, which is the central focus of activity. In that regard, it’s all a mess. Points you have put into strengthening the skills to Louis can be canceled out so easily, and frequently, in this episode that its as if they no longer matter. If you brought a bunch of logic points along the way then you can easily cash them all in now as this abundant resource from the previous episodes has received a massive inflation jump. A good example is in previous episodes I’ve only seen 4 logic points as a high cost with a few asking 5 or 6, but the brutal puzzle in this one wants a whopping 10. If you don’t have a stock in the chamber from multiple other episodes, you will not be making it through that puzzle the easy way. Additionally the main puzzle itself, which is usually a highlight to each episode, is abstract and hard to read. If you want me to solve a problem involving a series of symbols, letters, and numbers on an item it’s probably best to keep that item well lit and in the central focus. This is not the case in Episode 4, where the item is sometimes not shown, it’s dark and hard to read (on a 65″ TV), and it can be obstructed by text at the bottom. Once you figure out the puzzle, it’s pretty simple to get the answer you need, so on top of it all it’s a lazy implementation rather than the 30 minute head-scratchers from the previous two episodes. This is most likely because like everything else in this episode, it was rushed and not given enough time to fully develop. I have to admit that going into this episode I thought The Council was in a dire position and really couldn’t recover. Turns out I was wrong and if you’re willing to tear down the whole foundation you’ve built and start anew then you very well can, in a certain way, recover. I guess I just can’t believe the development team actually did it and I’d be shocked if this was in the design document from the beginning. Beyond the crazy pivot of the plot at the expense of characters and all the story that had come before it, episode 4 is a rushed hot mess. The mechanics are being re-worked, the important factors completely retooled, I think the plot can go in all sorts of wild directions depending on your previous and current choices, but it seems like way to much work to do all of these episodes twice. You’ll even see bugs and spelling errors, proving that everyone was in a hurry from the coders to the testers to even the localization editors. I don’t think a score is even appropriate because I have no idea how each player will view the big shift, but I’ll assign one that demonstrates how I feel about it. If nothing else I’m ready and willing to get my hands on episode 5, if only because there are a ton of loose ends to tie up and I have no idea how in this confined space The Council is ever going to pull it off. I guess we’ll see. A review code was provided by the publisher for this review. Ripples is available now for season pass holders and later as an individual episode. It took approximately 2 hours to complete. The Council can be found on Playstation 4, Xbox One, and Steam for $29.99 as a complete season package. On consoles only, individual episodes can be found for $6.99 apiece a week after it releases to season pass holders. A review code was provided for the purposes of this review. The Council is currently only sold as en entire 5 episode bundle for $29.99 on Steam (Windows PC only), PS4, and Xbox One. This review will update as each episode releases, but a post will be also be made containing simply the single episode’s review.